Where is that blasted squire? Hey Windstruck, I was wondering about the Titan armor shirt that you wear. I've got a dirtsurfer enroute and I'm planning on donning quite a bit of "plastic courage" when riding it, especially with kites. I've done some looking and it's the best thing I can find in my price range, only issue is that there is no where local to try one on. If you don't mind my asking roughly how big are you and what size did you go with? Also, is it too bulky to wear under winter clothing? Figure if I'm getting one might as well get something I can use its the snowboard as well. I'm planning on ordering one of these shirts as well as motocross style shin/knee protectors (they look like they'll fit better under snow pants). Never had any experience with wrist guards, anybody have any recommendations if they're worth it and point me in the right direction if they are? Other than that I'm going to just rock my snowboarding helmet for now, but if the dirtsurfer is as much fun as I think it's going to be I'm probably going to end up getting something a little more warm weather appropriate, probably with a little more protection as well. This may well be overkill, but my first kid is 18 months old and the second one is on the way so I'm trying to keep my priorities straight and my risks minimized. Thanks! "How big a boy are ya?" you ask? Call it 6 feet and a rock hard 220 lb. That rock hardness covered up with just a tad of pudge, you know, for modesty's sake. I ended up going with an XXL and it seems to fit true to size. There is a fair amount of spandex or some similar kind of stretchy material throughout along with quite a few Velcro adjustable straps so you've got some play in it. I had originally tried on John's (cerebite) XL at IBX2016 but it was a tad "snug". As for fitting under winter garments I would tell you that the shirt is skin tight but somewhat bulky by its very design, adding girth throughout with all of its various plastic plates, padding, and the like. I plan to wear it this winter for Snowkiting but my wind shell is quite oversized. If you were planning on putting it under something that fits well now and isn't stretchy then I'd say it will not work well. So, say you fit in a Large winter jacket without the Titan shirt then you'd need to upsize to an XL jacket for comfort. Having pretty much walked away from a 30+ ft plunge with this shirt on I would naturally recommend it. My suggestion would be to get it and then try on your jacket over it. Snowkiting and the like is pretty vigorous so unless it is bitterly cold you won't likely want much insulation on your upper body. So worse comes to worse and you pick up a cheap oversized shell. Problem solved! How Ironic that it was exactly this batch of plastic courage that potentially saved WindstrucS-P-A-M-L-I-N-K-s life shortly after. How fortunate you didn't bow to pear pressure and protected your brain + body! I wonder what you think about your " paper cut from grass " outlook now? Generally, making somebody feel bad about padding up isn't cool. I FULLY get the " plastic courage " approach ! Many of us, myself included live with daily pain from old kite / sport injuries. When you get older you don't bounce back as fast and old injuries come back to haunt you. I didn't fully understand that when I was younger but am finding it's true. Of all my safety gear my helmet has saved me most often and at the times I least expected. I wear it every time I put a kite up. I add gear relative to the day. Putting on the proper safety gear TRULY allows my mind to allow me to push it harder than without. It allows me to trick my old brain and take chances. Thanks Ken! Hard to stop the march of time.... I was a downhill ski racer through college and now have a bunch of places around my body that remind me on a daily basis about my short days of glory back in the late 70s and early 80s. Since my recent "flight of fancy" left me in need of a new helmet ( ) I picked up one that to date I am pretty pleased with. This helmet was designed for downhill mountain bikers, folks pretty much as crazy as us! What I like about it is the ventilation. 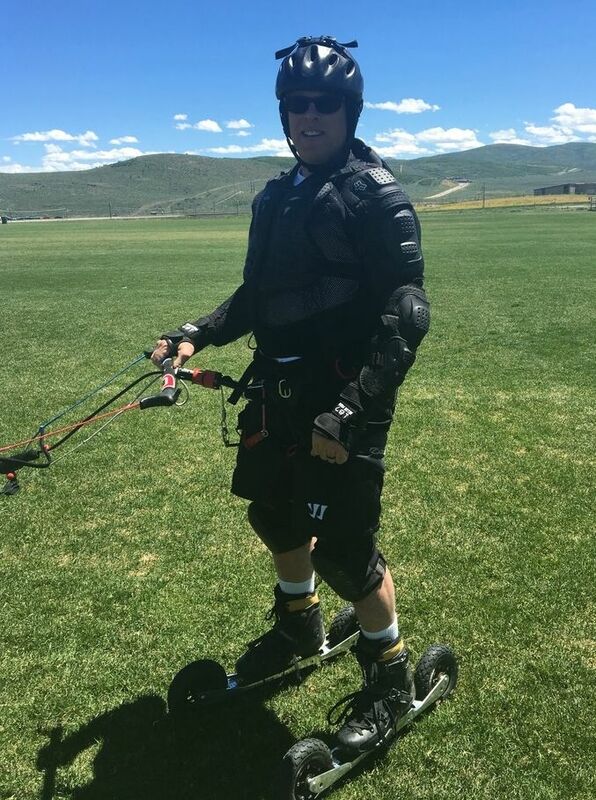 Both downhill mountain biking and kite buggying share in common the fast speed and need to keep your head cool with nice air flow. I can wear this helmet in reasonably warm low humidity weather (80's) and not sweat up in it. I have a motorcycle helmet that is also full like this one but I get super sweaty in it. I will save that latter one for Snowkiting when the extra warmth will be welcome! I'm confident in my masculinity and am more than willing to put however much Plastic Courage on my body as I deem necessary for any given event. I'm tracking right with you about needing to calm the inner voice. I don't look to silence that Lamb within me mind you as it is probably the one voice that keeps me alive at all! Hell, I'm only 27 and I already hurt from old injuries. An evening with a knee board designed for water being pulled behind a skidoo on snow comes to mind... One hell of a fun time, but then I drove to work for two months with my left leg because my right one hurt too bad if I kept it bent for more than 10 minutes. I'm half worried what I'm going to be like when I'm 60 with the injuries I've already bestowed upon myself, let alone with what's still to come. I've been leaning towards the mountain bike helmet as well for summer protection, might have to wait a little while after this purchase before I run that by the wife though... Luckily this weekend is my anniversary, so I'm getting the safety gear "as my present" Anywho, wondering if anyone has opinions on full face vs 3/4 face and the other options? I know I read a thread somewhere on here, I believe referencing Bigkid's experience, about the possibility of the full face actually digging into your chest on impact (or worse). I'm hoping the combination of body armor with a chest protector like this would prevent that possible issue? Hell, while I'm going full bore on this safety thing anyways, does anyone have any experience with the neck braces designed to support the bottom of the helmet on your shoulders if you take a header? (Basically a big foam donut that stops your neck from being crushed when you land helmet first) not even sure if a mountain bike style helmet would go low enough to work with those? Or how much they limit your movement? That skidoo romp sounds like something I would have done too! Yup, Jeff (BigKid) had one hell of a run in with a full face helmet, you remembered correctly. Safety equipment designed for motorcross and downhill mountain biking seem to make sense to me too. Same high impact requirements during an athletic outdoors activity where the athlete needs mobility and dexterity. I live in ski resort country and have seen all manner of safety gear as you described on folks bombing down the mountains in the summer. The stuff is pricey but then so is the price of not having it on when (if) you actually need it.